This came about because I couldn’t decide what to make and I was tired and wanted something quick and easy. So at first I was considering making soft tacos with the chicken thighs and maybe make salsa. But I really wanted some rice. And I know the husband would feel more full with rice than with tortillas. Before I even made up my mind, I started preparing the ingredients, pulling them out of the fridge, the cupboard and started chopping. By the time I was in the middle of chopping, I had a working idea for flavor and texture. Anything saucy always is an easy sell with my family. Something with gravy or sauce that they can put over their rice, they would be happy with. Anything fried, and they are in heaven. 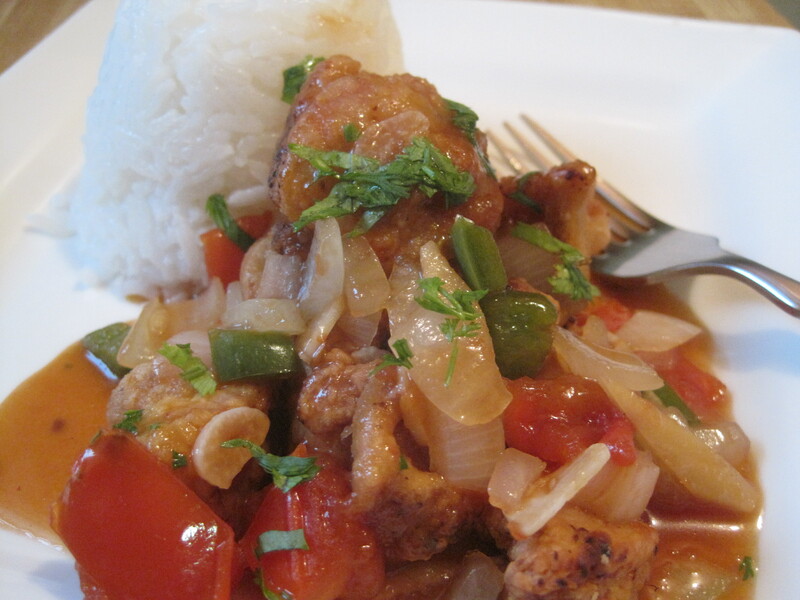 So based on another recipe I usually reserve for fish, I decided on this version using boneless, skinless chicken thighs. I had the making for salsa in the fridge and I had briefly considered making chicken tacos or burritos but we just had fish tacos a few days ago. 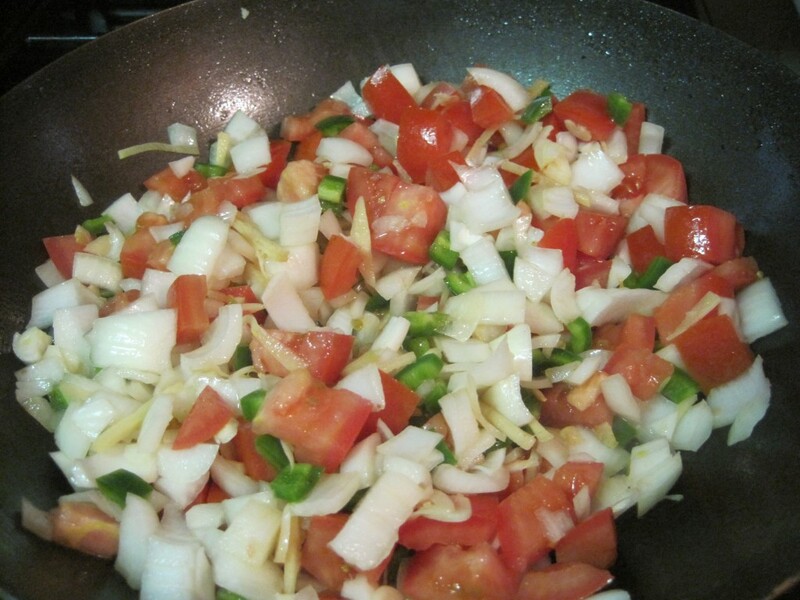 So taking the tomatoes, onions, and jalapenos, I added garlic and ginger and gave them all a rough chop. I also mixed up the cooking sauce which consisted of soy sauce, vinegar, salt and sugar. Tasting the flavor balance before adding a teaspoon of cornstarch as thickener. Heat a tablespoon of oil and saute’ the garlic and ginger first to coax out the flavor and fragrance before adding the tomatoes, onions and pepper. Let it cook down and soften. Add the cooking sauce and let the mixture cook to blend the flavors and for the sauce to thicken. Taste and adjust the seasonings until you have a balance between sweet, spicy and sour. When the sauce is done to your liking, add the chicken which you had fried after a light coating of flour, salt and pepper. You can let the chicken simmer in the sauce or leave them floating on top like I did as my family likes to preserve some of that crispness from frying. Here’s the printable recipe and approximate proportions. As with any recipe, adjust the proportions of the seasonings to suit your taste. 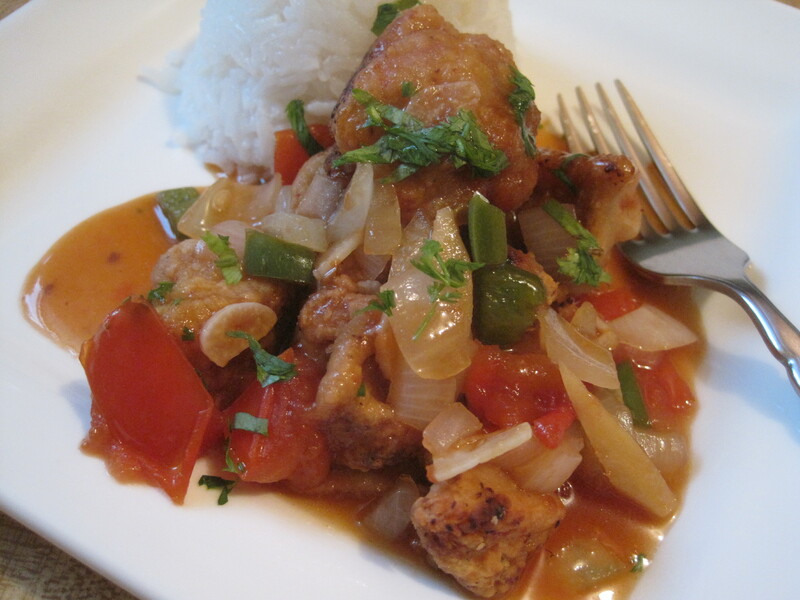 This dish is a type of a sweet & sour dish that pairs best with steamed rice. With the amount of vegetables in the sauce, there's no need to cook an additional vegetable dish to round it out either. Heat enough oil in a wok or skillet to fry the chicken in. While the oil is heating, Salt and pepper the chicken pieces and toss in the flour. I usually put the flour in a plastic bag and toss in the chicken pieces to coat them easily and without mess. 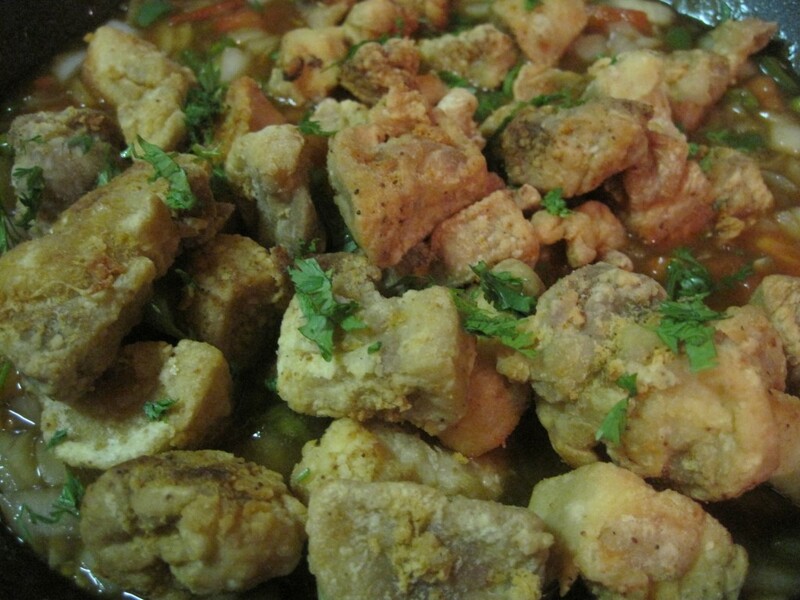 Shake off excess flour from the chicken pieces and fry them in the hot oil until they are cooked and nicely browned. Set the cooked chicken aside. Using the same wok or skillet, pour off the excess oil from frying the chicken, leaving about a tablespoon. Add the garlic and ginger and saute' in the oil for a minute until fragrant. 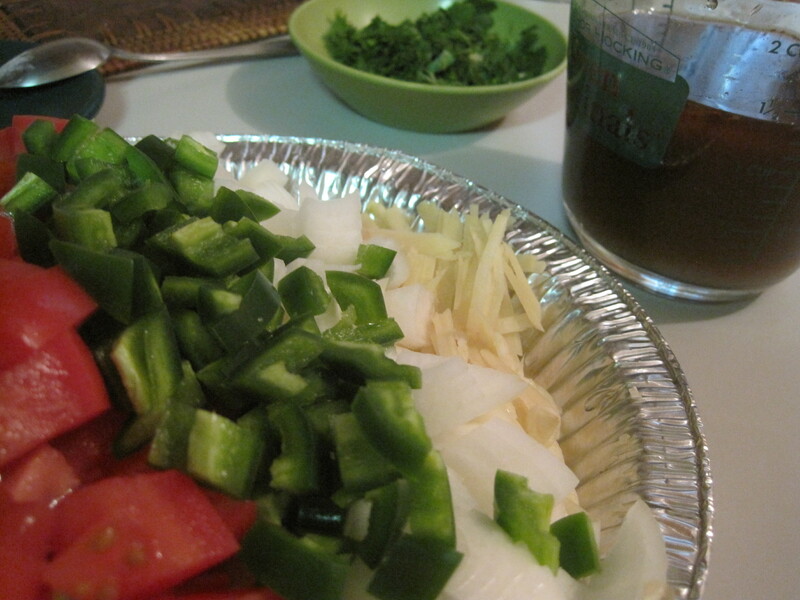 Add the rest of the vegetables: onions, tomatoes and jalapeno peppers. Stir to cook for a few minutes until the tomatoes start to render its juice and the onions are tender. While the vegetables are cooking, you can mix the cooking sauce in a separate bowl or cup: vinegar, soy, water, sugar and cornstarch. Taste and adjust proportions to suit your taste. 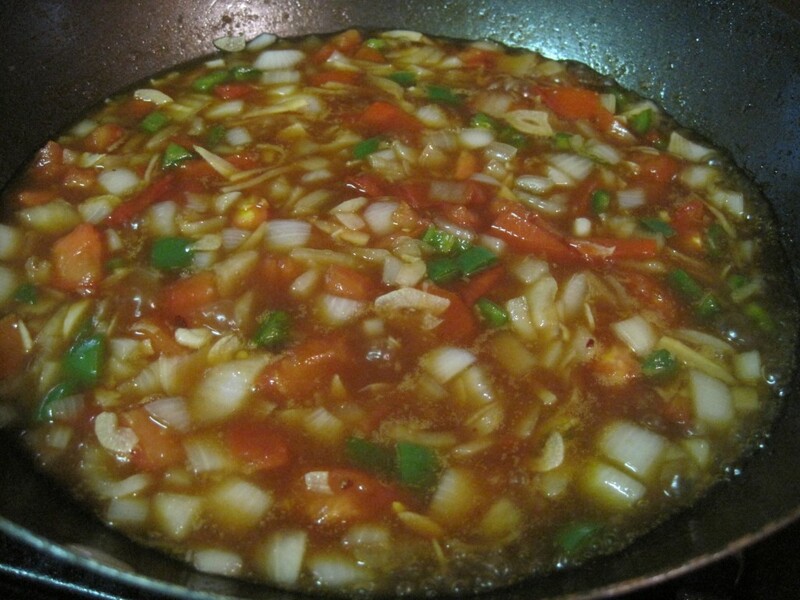 Add the cooking sauce to the pan of vegetables and let it come to a simmer. Cook for another minute or two until the vegetables are cooked as you like them and the sauce has thickened. Add the fried chicken pieces to the sauce. Top with chopped cilantro. As I mentioned above, the proportions are approximate. I always adjust the proportions to balance out the flavors. If you prefer more sweetness, add more sugar. And so on. If I didn’t have any fresh Jalapeno, I would have added some chili pepper flakes to the sauce to get some spiciness. As it was, the jalapeno provided plenty of spice in this version.